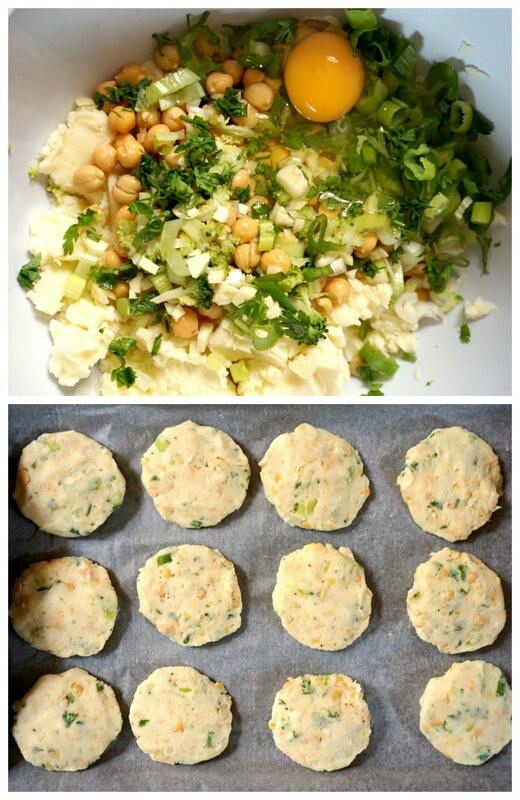 Vegetarian Chickpea Patties with Broccoli and Potatoes, scrumptiously golden, and so addictive. Great as an appetizer, and one of those healthy snack recipes kids love. Why not have one in between meals, or take some on a picnic. They are so easy to make, you’ll never buy ready-made patties again. You wouldn’t think much of a tin of chickpeas, it’s really cheap – a 400 g tin costs about £0.50, yet you get so much goodness for that bargain. Chickpeas are rich in fiber and protein, and are also loaded with vitamins and minerals that are essential to a healthy body. Pretty amazing, isn’t it? Buying a package of chickpeas would save you even more money, although l admit it’s just dead easy to open a tin that has the chickpeas already cooked and ready to use, than soak them overnight and then boil for a bit. Call me lazy, but if l can save some time, why not use shortcuts? They can be life savers when you have too little time, but don’t want to eat rubbish. 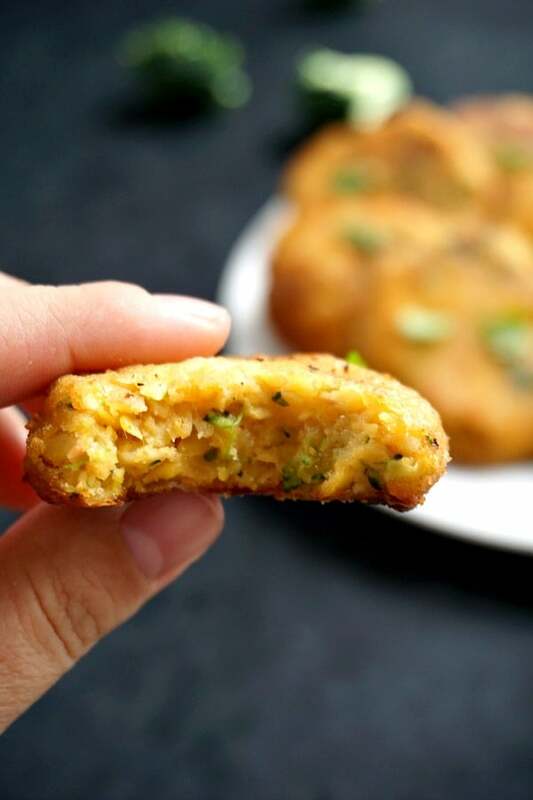 My chickpea patties recipe is super yummy, and l could not stop eating them. I had some veggies left that needed cooking sooner rather than later and l put them to great use. I chose to remove the chickpeas skin, I know it is such a task, a very boring one, but in this end, all the effort pays off, as you get smooth texture. Plus, you can mash them a lot more easier. 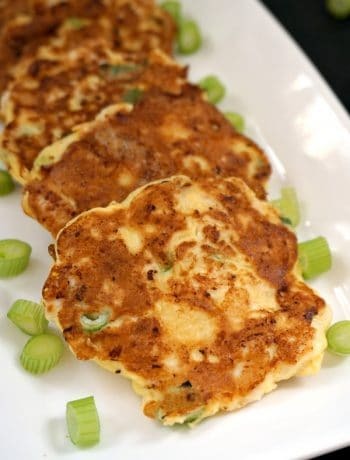 Leek and potatoes work great together, so you know these patties can only be super delicious. Please note!!! When you add egg to the mashed mixture, this tends to becomes pretty soft, that is why it is advisable to chill the patties in the fridge for at least one hour before frying them. Otherwise they won’t keep their shape while frying. A GOOD TIP when you shape the patties is to moist your hands, in this way the mixture won’t stick to your hands, and you get nicely-shaped patties. I would not deep fry them, just shallow frying should do, just get the oil very hot beforehand. Once ready, transfer the patties to a plate lined with kitchen paper so that they excess oil can be absorbed. And that’s it, really, your chickpea patties recipe to get everyone talking about! If you’ve tried these VEGETARIAN CHICKPEA PATTIES WITH BROCCOLI AND POTATOES or any other recipe on the blog then don’t forget to rate the recipe and let me know how you got on in the comments below, I love hearing from you! You can also FOLLOW ME on FACEBOOK, and PINTEREST to see more delicious food and what I’m getting up to. 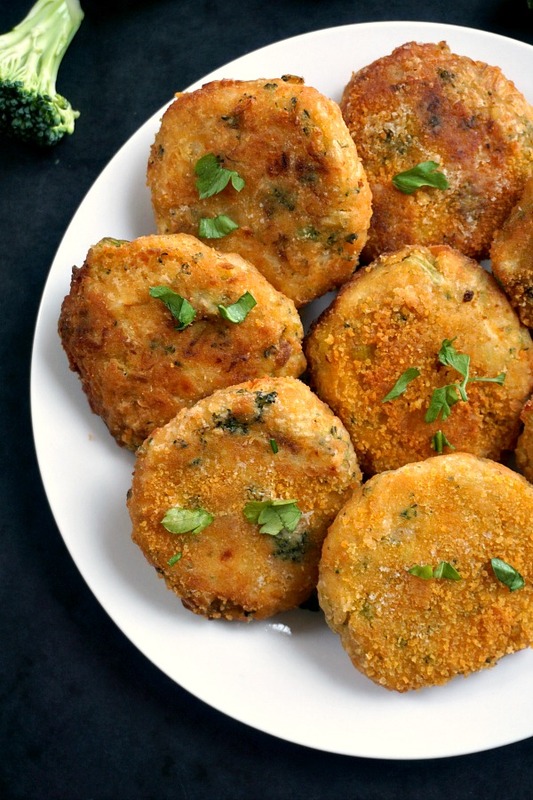 Vegetarian Chickpea Patties with Broccoli and Potatoes, scrumptiously golden, and so addictive. Great as an appetizer, and one of those healthy snack recipes kids love. Why not have one in between meals, or take some on a picnic. They are so easy to make, you'll never buy ready-made patties again. Drain the chickpea liquid, rinse with water and remove the skin off the chickpeas. Peel and dice the potatoes and boil in salted water until tender. 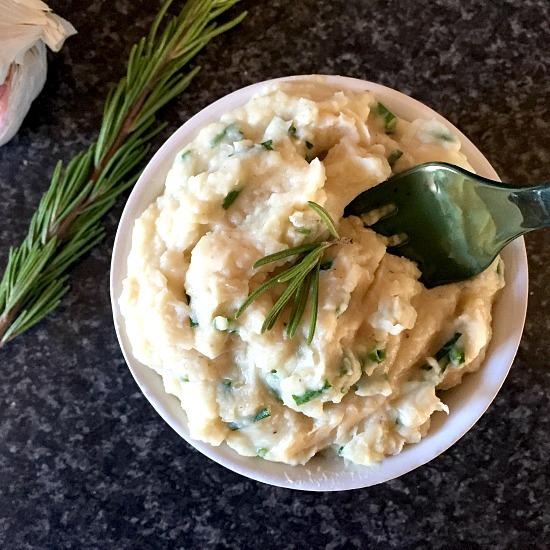 Drain the water and mash them together with the chickpeas until you get a smooth consistency. Set aside to cool. Cut the leek and sauté it in one tablespoon of oil until tender, then add the broccoli florets chopped finelly and stir for a minute. Pour half a cup of water and let it simmer until evaporated and the leeks and broccoli are soft. Mix the leeks and broccoli with the potatoes and chickpeas, season well with salt and pepper, add the breadcrumbs, cheese, parsley and egg and mix well to combine. Moist your hands and shape patties, then coat them in flour and arrange on a plate. Cover with clingfilm and chill in the fridge for one hour to firm up. Heat up the oil in a frying pan, and fry the patties on both sides untll golden. Serve warm or cold. These look so very tasty. Love the addition of cheese in it. I am going to stand up and admit, I am a chickpea addict lol. These look amazing! Thank you, Angie! Chickpeas are really amazingly delicious! I do love chickpeas, they are very versatile. These sound tasty. 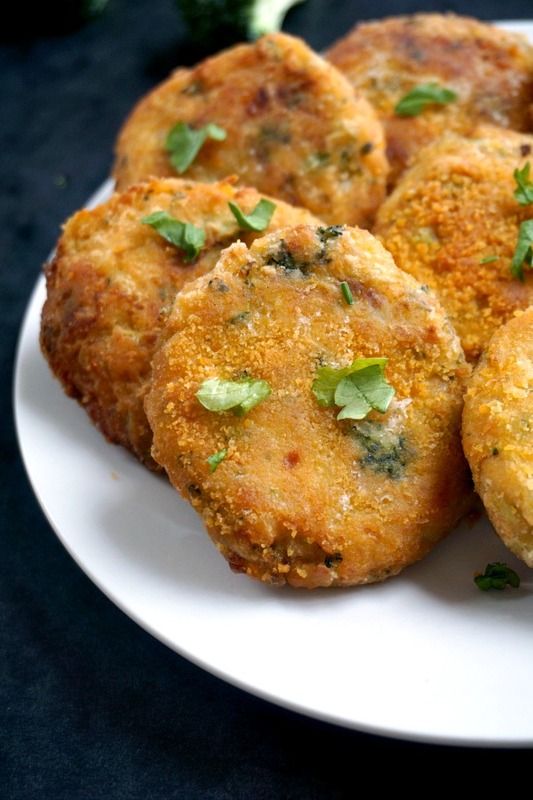 I love vegetable patties but never thought of adding chickpeas to them. Love this. So yum. 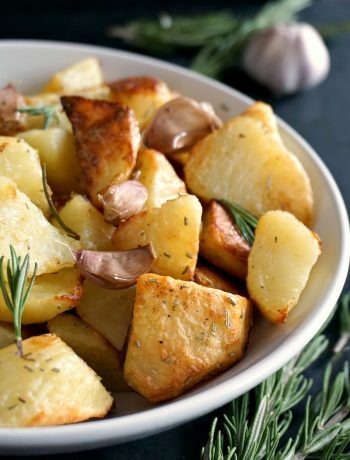 What a great idea to use chickpeas and potatoes to make a beautiful bite. Perfect for an appetizer but also to add to a salad. I would definitely love to snack on these!! These nibbles would be consumed so quickly in our family as we love chickpeas! Thank you, Alicia! So nice of you! ? These look delicious and something I definitely would love to try. I’ve never tried saving the liquid from chickpeas but sounds like I might be missing out. Totally love using and working with chickpeas. Packed with nutrition, and the perfect meat sub as well. These patties look and sound delicious. Great as a side to many dinners. I absolutley love chickpeas and I love how versatile they are that you can make stuff like this with them! These look so flakey and delicious! I need to try these out for sure! I’m always looking for ways to incorporate more protein into our diets and we all love chickpeas. This seems like a great way to sneak more veggies into my daughter’s diet. I had absolutely no idea the liquid chickpeas are packed in is so versatile! The patties look and sound amazing, I am definitely going to try this, I think they would make a great appetizer. 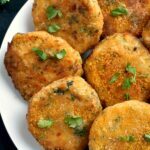 I love vegetable patties and it is a great way to add the vegetable to the kids meal. I also add any kind of bean to the patties ans the chickpeas are one of my favorite. I am guilty of throwing away so many cans of chickpeas liquid. I need to try to use it instead of egg whites. I love making patties for my family. We all love it. I can agree with you, patties are sooo addictive, healthy and just delicious. Love the addition of cheese in this one. I will definitely try this recipe. I love anything with chickpeas, I can see myself making a salad and putting these on top. A little dressing and a yummy dinner! These definitely look flavorful and loaded with deliciousness. My oldest daughter would enjoy these very much! Lately I’ve been loving savory snacks in the afternoon as a pick me up to get me through til dinner and these seem to fit the bill perfectly! Hi, could you freeze these? If yes, at what stage would you freeze them? Before you fried them? Hi Stacy! Thank you for your comment! I haven’t tried to freeze them before, but l think they would freeze well. I would probably fry them lightly first, a more pale yellow rather than golden brown, and to defrost l would pop them in the oven. I hope this helps. Hi, I made these and they turned out quite decently! However, I’m wondering if there’s a way I can get the middle to be a little less complete mush? They’re not falling apart, but definitely not holding together as well as I’d like them to! Hi! Thank you for your comment! Did you refrigerate the patties before frying? Frigerating helps them keep their shape really well. Once the egg is added, they become soft, so if they are fried straight away, they will be mushy. Another thing that woukd help is not to add the oil from the leeks and broccoli to the mixture, as that will change tge consistency. Also, drain the potatoes really well, when they are mashed with the chickpeas, you should not have a soft mash. I hope this helps. Would they work without the egg. Hi! Thank you for your comment! They should work without the egg too, just add enough breadcrumbs to keep the patties together. I usually add an egg to make sure the patties don’t fall apart, and then refrigerate to firm up. I hope that helps! Thank you, that’s great! I’ll share your post. I am eager to give these a try as a new vegetarian. But I was wondering how long these can be kept in the fridge once cooked? Hi Emma, If kept in a plastic container, they should be fine for 1-2 days. I hope that helps. Hi Eliza! Thank you for your comment, l am happy that you enjoyed my recipes, my little ones are big fans of parties too. The nutritional info is per portion. I hope this helps! Can you use sweet potato? I don’t eat white potatoes. Absolutely, they should taste good.